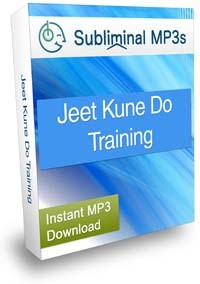 Get more from your jeet kune do training and advance your skills way beyond their current limits with this mind penetrating subliminal messaging album. This album is not an overnight miracle solution. It will not magically turn you into a martial arts expert. It simply works as a training aid and is designed to give you an advantage and a boost in your training - to help you get more from it and to advance at a faster rate. It will ultimately instill in you the type of mindset and patterns of thinking which are shared people who are just seem to learn jeet kune do naturally and advance at a fast pace. Once you share these exact same beliefs and ways of thinking too then your jeet kune do will advance at a much faster rate! Improve your ability to concentrate and your levels of focus while you are training. This means that you will get the most out of your practice, things will just sink in easier, and you will learn new techniques much faster. Boost your levels of motivation and your drive and hunger to learn more than ever before. You will train harder, and more often. You will push yourself further and further in your jeet june do training - you will stop taking short cuts or letting yourself off lightly with your training. Instead you will really feel a burning desire to excel yourself and your current level of ability. Make you much more analytical and critical about your jeet kune do. You will become a perfectionist, always self analysing, breaking down your every movement and thinking how you could improve. You will be 100% dedicated in mind and body, and importantly, your subconscious mind will be completely behind your training goals - nothing will be able to hold you back! Try to make sure the messages are fresh in your subconscious mind by listening to this album before your training sessions and straight away you will feel much more motivated and really start to push yourself; you will feel really energized and driven to train. Over the next 2-3 weeks if you keep using the album you will then really see a big difference in your jeet kune do skills; in your technique, movements, and posture. Download this powerful subliminal audio album now and advance your jeet june do at a much faster rate!